Gene Larew Lures, makers of Bobby Garland crappie baits and Gene Larew bass lures, announces the introduction of the Slab Hunt’R for crappie fishermen. 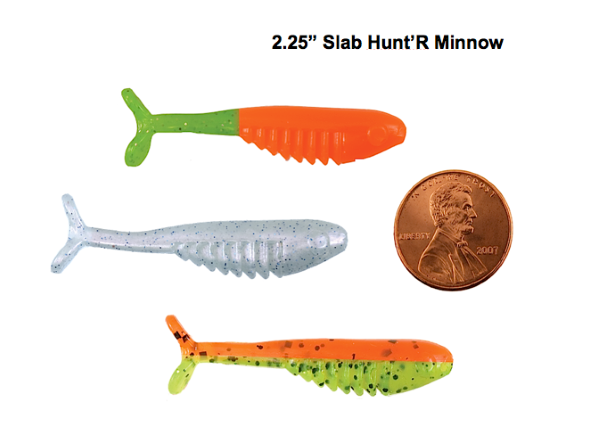 The Slab Hunt’R is the perfect size at 2.25 inches. Not to small, not too large. It has a bulkier profile than typical minnow-style baits. The easier a crappie can see a bait, the easier it is to trigger a bite. A bulkier body also slows the fall rate. The tail is another unique feature. The company claims it is the easiest swimming tail in the Garland lineup. Action draws more attention. So what does the profile and the tail’s ease of movement mean? It makes a particularly enticing choice for spider rigging and long-line trolling. It has “ribs” on its body for added vibration and to hold scent. The deep body is also ideal for insertion of an optional crappie rattle when vertical jigging or with float/jig techniques. Bobby Garland baits are known for plastic that is brilliant in color and soft, yet not so soft that it tears easily. This bait is available in solids, laminates and head/tail color choices. The Slab Hunt’R provides a different profile and tail action. Sometimes the difference in getting bites is to give the crappie something with a different look. Fishermen now have a great option for that “something different” advantage. MSRP is #3.79 per 10-count bag.